1 2 3 4 5 Click to share your rating 21 ratings (4.2/5.0 average) Thanks for your vote! Gabriel Van Helsing is a man cursed with a past he cannot recall and driven by a mission he cannot deny. Charged by a secret organization to seek out and defeat evil the world over, his efforts to rid the world of its nightmareish creatures have been rewarded with the title that now follows him: murderer. Van Helsing roams the globe an outcast, a fugitive, a loner, himself hunted by those who don't understand the true nature of his calling. When dispatched to the shadowy world of Transylvania, Van Helsing finds a land stll mired inpast-- where legendary creatures of darkness come to life--a place ruled over by the evil, seductive and unfeatable vampire, Count Dracula. And it is Dracula that Van Helsing has been sent to terminate. Anna Valerious is one of the last of a powerful royal family, now nearly annihilated by Dracula. A fearless hunter in her own right, Anna is bent on avenging her ancestors and ending an ancient curse by killing the vampire. Joined by a common foe, Van Helsing and Anna set out to destroy Dracula along with his empire of fear. 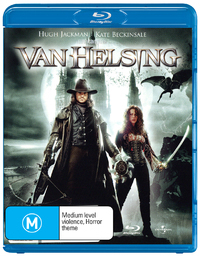 But in challenging an enemy who never dies, Van Helsing uncovers a secret he never imagined and comes face-to-face with the unresolved mysteries of his own enshrouded past.